I had a small amount of roast pork leftover from my recent hornado de chancho dish and decided to use it to make a quick after school snack for the kids. I was debating between making them a quick quesadilla with the pork, or even some empanadas, when I noticed there were a few slider rolls that needed to be used. I had ripe avocados and almost always have cebollas encurtidas or lime pickled red onions in the fridge. My kids love spice so I also added a bit of aji criollo hot sauce to the sliders. The combination of the pork hornado, creamy avocado, pickled onions, and cilantro aji in one bite is amazing. 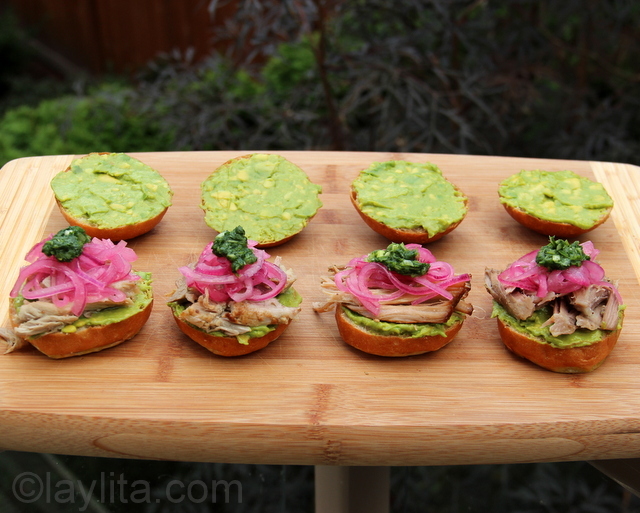 Pork sliders made with beer cumin roast pork, avocado spread, lime pickled red onions and cilantro hot sauce. To make the avocado spread, mash the ripe avocadoes with the lime juice and some salt. Spread the avocado mix generously on both sides of the sliders. 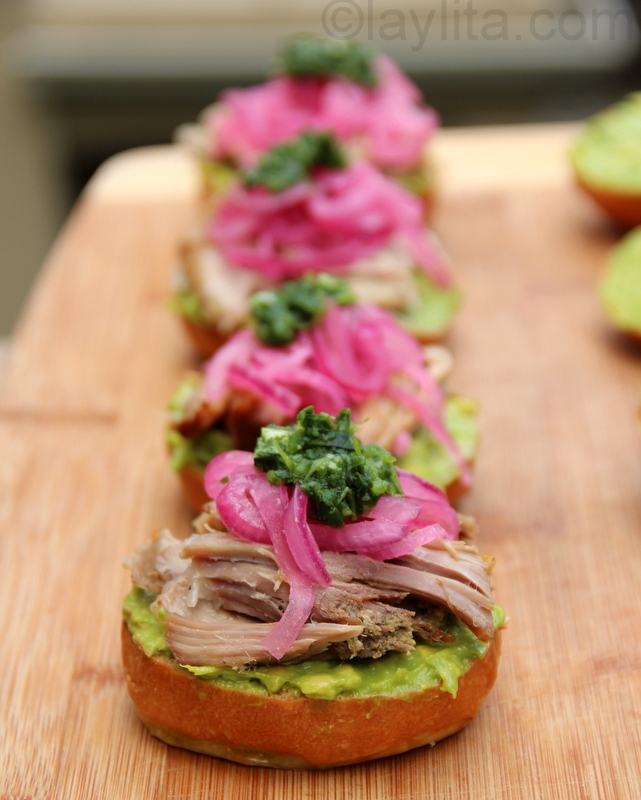 Add the shredded roasted pork and top with the red pickled onions and aji criollo sauce. These mouthwatering pork sliders, in addition to being a great snack for kids (or hungry husbands), would also make great appetizers for a party. I’m already planning to use some of the leftover pork from my Christmas hornado o pernil to make these as an appetizer for New Year’s Eve – and probably some empanadas too. These are gorgeous! I love pork sliders and my kids loooove spice too! Great looking recipe. Looks so tasty and my husband would love! How do I create the pickled lime and red onion at home?